Janome Sewing Machines - Find the Right Fit for You! 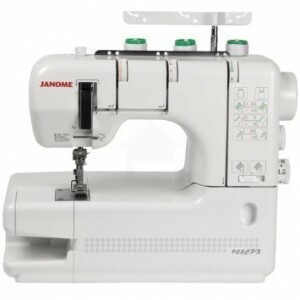 In the world of sewing, Janome sewing machine models are considered to be one of the best out there. So, if you are looking for a model that can get the job done, and do it well then you don’t have to look any further as we have the answers for you right here. If you are searching for a digital model, or a manual one, you’ll find them here as well. If you have different needs like quilting and embroidering, we have got that covered too! We have reviewed the top models of the Janome brand, we have taken into account the quality, durability, functionality, usability, price and efficiency for our review. We hope that this can help you find what you are looking for, so without further ado we give you the top sewing machines by Janome. Janome 1600p sewing machine is a high-speed sewing and quilting machine that boasts of having a speed of 1600 stitches per minute. This device offers every possible advantage that you need to complete projects quickly and in the fastest way possible. There is a work area of 9 x 6 inches to the right side of the needle that should give you enough space to work comfortably and without any worries. The site loading bobbin provides easy access, even from a quilt frame while the automatic thread cutter should help you cut bobbin threads and top with just the push of a single button. This machine comes with an independent motor that will allow you to wind bobbins without interrupting your sewing. The ergonomic knee lift makes it easy to raise the pressure foot as you don’t have to compromise with the work at hand. The bonus kit includes a Ditch Quilting Foot, Darning Foot with Plate, and 1/4 inch Seam Foot. 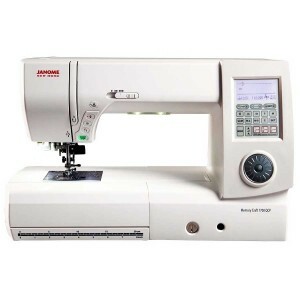 The Janome CoverPro 900CPX is a cover stitch machine that combines the best of industrial style hem machines with the convenience of home usage. As a result, you’ll get a heavy-duty, high-speed, long arm cover hem machine that looks and operates just like a regular sewing machine but produces fabulous cover stitch work. The product measures only 19.7 x 16.5 x 14.3 inches in dimension and weighs only 23.7 lbs, making it one of the lightest and most convenient sewing machines that exist in the market. There is a workspace of 4.5 inches right to the needle that will give you enough area to work on your project comfortably. This model could be the perfect gift for someone who loves sewing, or you could buy this for yourself and impress everyone with the results. And, if you want to read the full review of the product, you can go to the link above to see the full specifications, features and other things about this particular Janome model. The Janome 7700 QCP quilting machine is an automatic sewing and quilting machine that offers a great value for money due to its highly desirable features. It has been built based on the Janome Memory Craft model, which is considered the most favorite ever for sewing and quilting. This machine has taken everything that made the 6600P such lovable and thrown in a few more attractive features to make it a product that is more than worth buying. It utilizes the Quilt Piecing System that provides an outstanding synergy of precision so that the results you get are nothing less than extraordinary. This model provides 11 inches of workspace in contrast to the 6600P that has 9 inches. There are 250 Stitch modules and 20 memory banks where you can store your favorite configuration to be used later. Navigation is easy as there is an LCD screen equally complemented by a jog dial. The exterior has been made using cast metal frame to ensure that your favorite quilting and sewing machine lasts for many years to come. 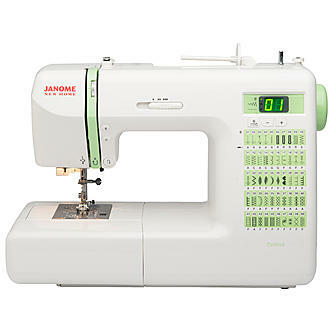 The Janome Memory Craft 6500P sewing machine is one of the most popular models of the company that has received rave reviews because of its blazing speed and different sewing tools. The professional grade 1 amp motor allows this machine to go as much as 1000 SPM on straight stitch, which means that you’ll get your work done in no time. For quilting, there is a throat space available of 9 x 5 inches, a hand-look quilt stitch, five unique blanket stitches for appliqué, and an advanced feed mechanism that can handle even the thickest materials you can throw at it. Some other attractive specifications include vertical thread delivery system, built-in thread trimmer, and independent bobbin winding system as well as for top load. There is also a knee lifter that will keep your both of your hands-free as you can use this mechanism to lift the presser foot. The built-in thread cutter is another feature that lets you trim threads with the press of a button. The Janome DC2012 model is a one-of-a-kind computerized sewing machine. It boasts of featuring 15 built-in stitches that you can use to complete any project including garment sewing, home decor, scrapbooking, quilting, etc. The 50 stitches and three buttonholes give you the freedom to satisfy your diverse sewing needs in many creative ways. The SFS (Superior Feed System) exclusive to Janome assists in producing outstanding stitch quality while the computerized selection buttons for stitching gives maximum control over your craft. Work area to the right side of the needle is 6 1/4 inches, which should be good enough for most projects. Attractive convenience features are easy to reverse, auto lock button, speed control slider, LED screen, and memorized up and down needle positions will give you unsurpassed ease of usage that you won’t likely find in any other model. This sewing machine is just 110 V and consumes little power to top it all off. 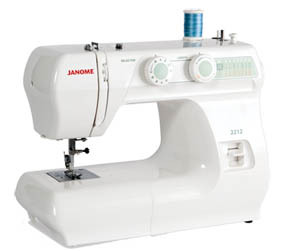 Lightweight and simple in design, the Janome 2212 sewing machine is an amateur’s favorite as it provides every basic necessity and doesn’t cost a fortune. This model is extremely user-friendly as it comes with an Easy turn dial pattern to control SPM speed that can go up to 1000. It consists of 12 built-in stitches including a four step buttonhole and Drops feed for easy quilting and free motion sewing. It gives you the option to stitch according to width and length adjustment to provide maximum ease of use. Other specifications include manual tension control, front loading bobbin and free arm, manual needle threading system, Reverse stitching, Automatic bobbin winding, and Thread tension adjustment. Rated at only 110 V, this sewing machine consumes very less power so that you never back down from finishing your projects due to electricity cost. Computerized sewing machines rarely get better than the Janome 7330 Magnolia sewing machine. This device functions as good as it looks with its 30 built-in stitches including six one-step buttonholes that will allow you to work on any home decor or other projects. There are fantastic automatic features and the company’s high-precision technology that makes this model worth the purchase. 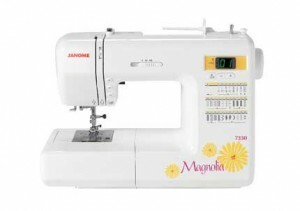 Some of the attractions of the Magnolia are the Backlit LED screen, easy navigation keys, 7-piece feed dog, Auto-declutch bobbin winder, Easy reverse button, presser foot lift and much more. 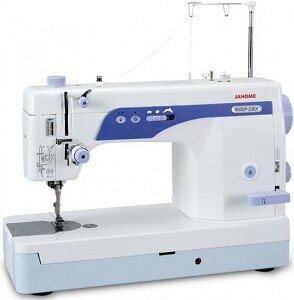 This model also comes with top-loading rotary hook bobbin, start/stop button, locking stitch button, up/down needle memory, and stitch chart to complete the package. With this item, you’ll no longer have to settle for inferior grade stitching quality because it has every function that anyone could want to complete complex projects. This model is another 110 V sewing machine that will ensure you do not end up with a massive bill amount at the end of the month. So, now that we have gone through what we think are the best Janome models today, we hope that it gives you a much easier time going out to shop for one as you have all the details that you can possibly need to buy the perfect one that matches your needs. The link to the full review are on each section of the product, if you want to check that out.